Cover image, Gregory Sholette, Delirium and Resistance: Activist Art and the Crisis of Capitalism. But Delirium and Resistance is (also) much more. Its value lies not just in collecting the histories of art activism, but rather in problematizing the position of such histories within the art world and within social movements. The former of these emerges, precisely, at the centre of one of the most interesting contributions of Sholette’s theorization. The first of three parts of the book, entitled ‘Art World’, tackles these issues. The contradictions of our art world, the need to consider creative processes and agencies as part of a broader entity, a ‘world’, and the urgency to envisage alternative totalities through resistant practices emerge as this section’s main ideas. It is comprised of three texts each focusing on the relationship between economy, art education and activism, where the insights of authors such as Marc James Léger or Yates McKee and the action of collectives and movements such as Global Ultra Luxury Faction, Liberate Tate, ACT UP or Madame Binh Graphics Collective are analysed. 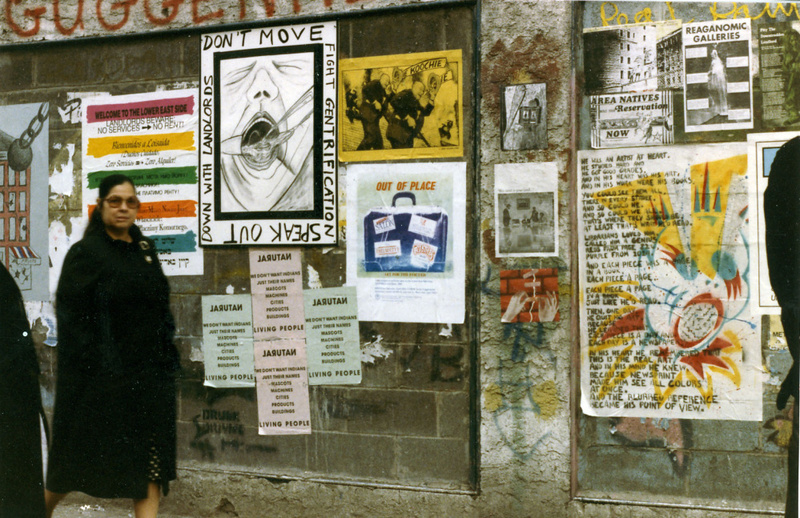 Political Art Documentation/Distribution anti-gentrification ‘Not For Sale’ project street posters, Avenue A and 10th Street, Lower East Side, New York City, 1984. The final essay in this part, ‘Art after Gentrification’, provides one of the most realistic and less optimistic sections of the book. It analyses cases of socially-engaged artists (Theaster Gates) and projects (Assemble Collective and Conflict Kitchen) that have soaked through the barriers of ‘mainstream’ economies of prestige and recognition. The essay reinforces the idea that despite the recent interest in social practice the art market remains a conservative system privileging individually authored object-based and conceptual approaches over daring collaboration. The text’s main interest, however, lies in bringing politics of race and class into the discussion of socially-engaged art. Whereas in previous texts difference was only considered ‘from outside’, that is, as part of the outsiders affected by artistic projects, in this case (particularly in the examination of Gates’s projects) it is located at the centre of the equation. I will return to this topic. 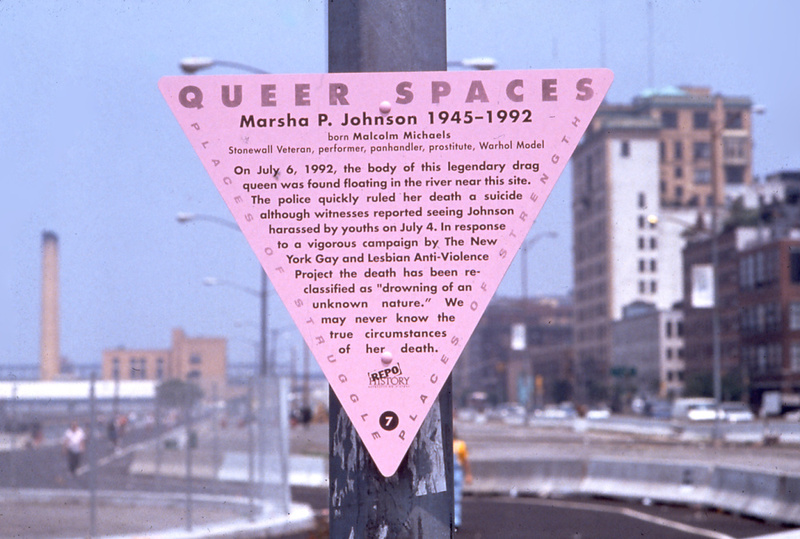 REPOHistory street sign dedicated to transgender activist Marsha P. Johnson as part of ‘Queer Spaces’, various locations in collaboration with The Storefront for Art and Architecture, New York, NY, 1994. The third and concluding part of the book, ‘Resistance’, comprises an affirmative counterpart to the tactical strategies presented in the previous one. The four texts included represent a body closely connected to Sholette’s previous books, Collectivism after Modernism (co-edited with Blake Stimson in 2007) and Dark Matter: Art and Politics in the Age of Enterprise Culture (2010). Towards this end, the eighth essay constitutes something like a prehistory of Collectivism after Modernism whilst the ninth furthers Sholette’s concept of artistic dark matter in a moment when it is ‘becoming clearer’. (Dark matter defined as the creative force of the unseen mass of creative labour excluded from the visible top of the art system.) But it is in the two concluding essays where this section gains momentum. 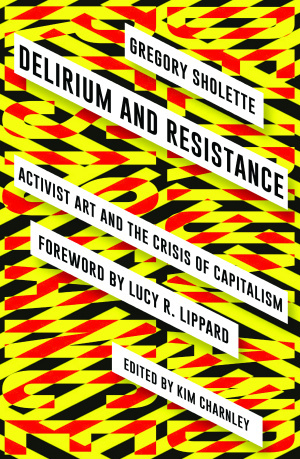 ‘Delirium and Resistance after the Social Turn’, the text that ends the volume and gives it its name, stands as one of the sharpest insights on socially-engaged art altogether. Delving into the contradictions of social practice in the moment of its maximum acceptance, it both psychoanalyses and performs an autopsy on the turn in order to uncover a point of departure. Psychoanalysing the dead, the text transforms the ‘there is no alternative’ appropriations of social practice into a lattice where present and former, successful and otherwise initiatives converge in unexpected ways. Throughout the essay Sholette urges for a reinvention of socially-engaged art’s future, one that can only occur through refashioning its genealogies. Here he superbly transforms this challenge into a question by asking: ‘How might our narrative about social practice art collectivism be imagined differently?’, or perhaps better yet, ‘How can it be shifted away from the market-based notion of “community as consumer-based demographic” that often, surreptitiously dominates it”?’9 Sholette undertakes by examining Nato Thompson’s 2004 exhibition ‘The Interventionist’, a landmark in the debates on art activism and tactical media that have nevertheless repelled serious examination ever since. Sholette’s essay connects ‘The Interventionist’ to the trajectory of its curator and to the complex positioning of its host institution, the Massachusetts Museum of Contemporary Art. The project, however, is conceived as the beginning of a future of more critical and more committed art experiences and experiments; in short, as a fertile stimulus for hypothetical yet possible trajectories of social practice. Under this view, socially-engaged art would not only be alive, it would be so in a way subjected to the confluence of past and present experiences, of heterogeneous crossings and nurturing afterlives. Precisely this point emerges as one of the book’s most promising exits. Dealing with a neighbouring subject – particularly with how European thought arrogated in exclusivity a sense of universality and timelessness – Dipesh Chakrabarty has argued that ‘it is only within some very particular traditions of thinking that we treat fundamental thinkers who are long dead and gone not only as people belonging to their own times but also as though they were our own contemporaries’.10 Could it not be possible to apply this analysis to artistic traditions as well? Activist and socially-engaged art are often judged only by (and therefore reduced to) its momentary success or failure, defining impact within the temporal and spatial coordinates in which they are produced. In contrast, ‘more conceptual’, ‘less engaged’ artistic practices are more easily incorporated to analytical counterpoints, their influence spanning across locations and epochs. In Sholette’s view, the trajectories and possibilities enacted by social practice become denser and deeper not only because they are embedded in the production of ‘real life’, but also because their consequences are extended and sought after beyond their most evident and immediate expressions. 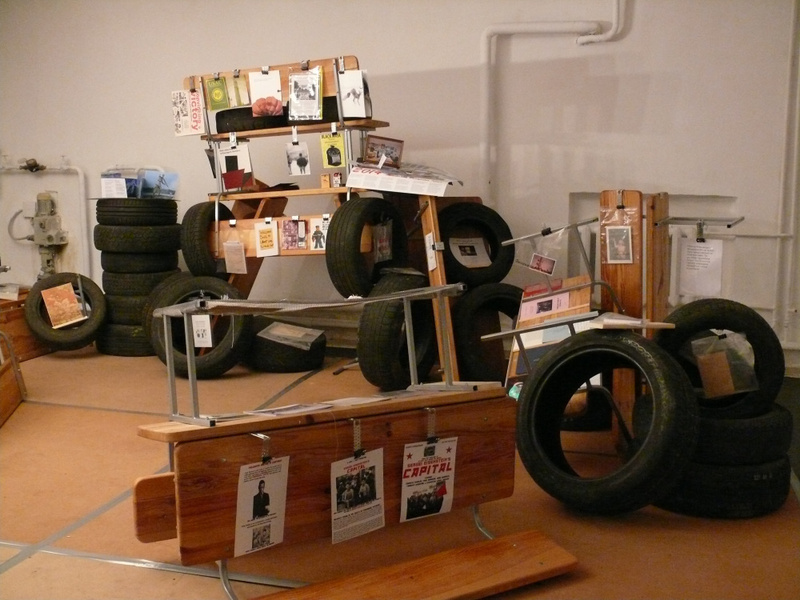 Installation view Gregory Sholette and Olga Kopenkina, Imaginary Archive: Kiev, Les Kurbas Cultural Centre, Ukraine, 2014. Delirium and Resistance closes not without leaving some questions open. One of these has to do with the global application of the ideas of dark matter and bare art. As some of the critical voices have pointed out, the replacement of the working class by a creative one is not a homogeneous reality. How are international art activists connected to the precarious situation of workers building museums in the Middle East? What kind of hierarchies and tensions can emerge when emancipative initiatives are developed through transnational cooperation? How are protests articulated geographically, spatially when heterogeneous communities are involved into a similar cause? What happens when socially-engaged and collective art projects play outdoor, intervening in not always well-known realities? Delirium and Resistance deals with these questions and reproduces examples of solidarity between US artists and Global South causes that are located at the epicentre of histories of racial artistic practice. However, a further exploration of potentialities and contradictions of these alliances would complete the otherwise thorough fresco painted by Sholette. These questions, it is worth noting, are not weaknesses but rather doors left open (many of which are addressed by Sholette himself in other texts), calling for an observant compromise with the reality and the experience of transformation beyond momentary trends, collapses and deliriums. Sholette revisits past experiences of activism without any sense of idealized nostalgia, critically repositioning them as a sharp lens through which we can confront horizon-less present. His insight provides a rare mix of emergence and history, strategy and conscious planning, enthusiasm and patience, a conjunction highly appreciated in a moment of superabundance of theories and ideals of emancipative action, not always followed by realist assessments of present political and cultural configurations. ‘Amnesia attacks and ongoing reinventions of the wheel’, Lucy Lippard writes in the book’s foreword, ‘are two things that have plagued social activist art and the left for as long as I can remember’.11 To avoid both things, Delirium and Resistance moves across different generations and geographies of engaged practice, seeking to explore alternative endungen and linkages binding failed and successful initiatives together, always grasping the resilient condition of their transformative potential.